Living Area 9,000 Sq. ft. 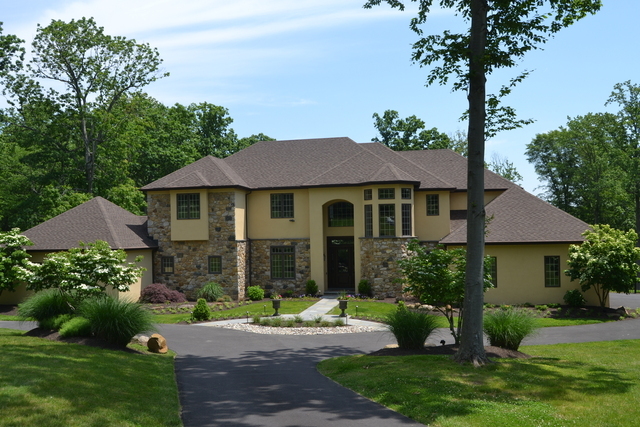 Located in the heart of one of Upper Makefield’s most coveted communities and locations sits this spectacular custom built home on 5 + acres. Featuring all of the requisite amenities excepted in an estate property, the home is traditional yet sophisticated and stylish with an expansive wide open floor plan. Magnificent kitchen / entertainment area with top of the line stainless appliances, granite counters, two story family room with wall of windows and floor to ceiling fireplace. A second intimate sitting area also has fireplace. The upper level features hardwood throughout, master bedroom with entry sitting area. A large princess suite with 3 additional bedrooms offer many options. The lower level may be the nicest currently on the market. Second kitchen, full service bar, wine cellar, gym, entertainment area, full bath and more. To top it all off, the fantastic outdoor space includes patio w/ fireplace, gardens, and perfectly sited in- ground pool. If ever a home was designed for entertaining, this is it.